In this lesson, you will learn to use toki in Japanese (時 - とき) to express the time when some states or actions exist or occur. 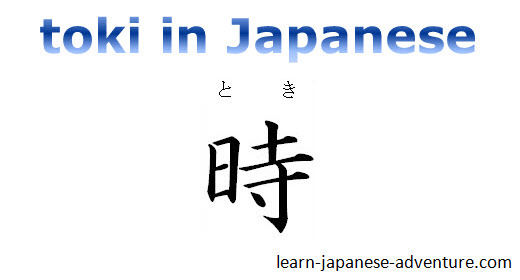 とき (toki) connects two sentences and expresses the time when the state or action described in the main sentence takes place. As shown above, the different forms of Verbs, い-adjectives, な-adjectives and Nouns that are connected to とき are the same as the forms when nouns are modified. Meaning: When you borrow books from the library, you need a card. Meaning: When you don't know how to use it, ask Ms Tanaka. Meaning: When I am not feeling well, I visit the doctor. Meaning: I watch TV when I am free. Meaning: When my mother is sick, I take a day off work. Meaning: When I was a student, I did not study much. Meaning: I used to swim in the sea when I was a child. The tense of adjective sentences and noun sentences which modify とき is not affected by the tense of the main sentence. In example 6 above, the English translation is "When I was a student, I did not study much". You used past tense for both the first sentence and second (main) sentence. However in Japanese, you don't need past tense for the noun sentence in front of とき (学生のとき - gakusei no toki). Tense does not matter here. In example 4 above, the English translation is "I watch TV when I am free". You can also say 暇なとき、テレビを見ました (hima na toki, terebi wo mimashita), which translated to "I used to watch TV when I was free". In both cases, it's still 暇なとき (hima na toki). The tense of the な-adjective sentences in front of とき is not affected by the tense of the main sentences. Let's use another two examples for toki in Japanese with adjective and noun sentences. Meaning: My mother was beautiful when she was young. Meaning: Mr Suzuki got married when he was 25 years old. As you can see, both examples are talking about past events but the tense of the adjective and noun sentences are not affected by the main sentences (in Japanese). With verbs, it helps to keep in mind that non-past form indicates an action that happens "all the time" or is "not yet completed". The past form is used when the action is "over and finished". Meaning: I bought a camera when I was on my way to Japan. Meaning: I bought a camera when I went to Japan. In example 1 above, 行く (iku) indicates that the action had not been completed. The speaker bought a camera somewhere on his/her way to Japan. (the camera could be bought in his/her own country). In example 2 above, 行った (itta) indicates that the action had been completed and the speaker bought a camera after arriving in Japan. Meaning: I say "Good Night" before going to bed. In this case you cannot use 寝たとき (neta toki) because it will mean that you are saying "Good Night" while you are sleeping. Meaning: I say "Excuse Me" before entering the room. In this case you cannot use 部屋に入ったとき (heya ni haitta toki) because it will mean that you are saying "Excuse Me" after you have entered the room. It's considered rude if you do this to your boss. Meaning: I said "Good Morning" when I met my friend this morning. In this case you cannot use 今朝友達に会うとき (kesa tomodachi ni au toki) because it will mean that you were saying "Good Morning" before you met your friend. You would be talking to no one if you did that. There is one common mistake that many people make when they using toki in Japanese. とき (toki) is a time expression. Therefore if there is already a time expression in a sentence, you don't add in とき after that time expression. Meaning: I drink coffee in the morning. Meaning: I drink coffee when I am sleepy. You can also use Verb て-form いるとき to express the time in the middle of action, while you are doing something. For example, ご飯を食べているとき (gohan wo tabete iru toki) means in the midst of eating. Meaning: While I was eating, Mr Yamada came to my house. Meaning: While I was sleeping last night, there was an earthquake.